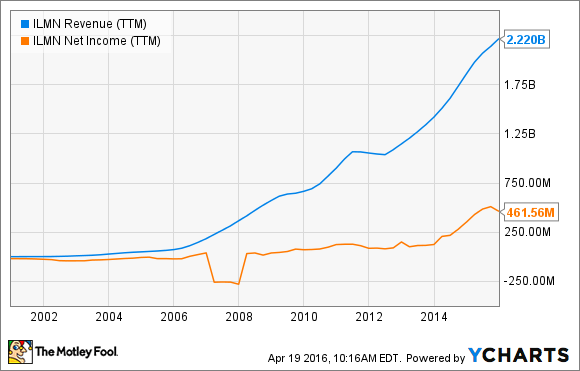 Are Illumina's Shares Worth Buying on This Drop? Lackluster sales growth is causing shares to drop, but long-minded investors may want to consider buying. After the closing bell yesterday, Illumina's (NASDAQ:ILMN) management surprised investors with lackluster preliminary first-quarter sales that caused shares in the gene sequencing giant to plummet. With shares deeply discounted from yesterday's prices, is now the time to add this growth stock to portfolios? Illumina's gene sequencing machines are used globally by researchers to peer into DNA, and resulting genetic discoveries are ushering in next-generation medicine that is more personalized than ever before. There are over 7,500 of Illumina's gene sequencing machines installed throughout the world (roughly 90% of DNA data is produced by Illumina machines), and sales of Illumina's systems -- and the consumables used to run them -- totaled $2.22 billion in 2015, up 19% from 2014. Although Illumina isn't the only competitor in the space -- Thermo Fisher (NYSE:TMO) and Pacific Biosciences (NASDAQ:PACB) are among its competitors -- Illumina is by far the industry Goliath. As you can see in the following chart, Illumina's revenue path has been mostly, but not entirely, a straight line higher. That's an important thing for investors to remember, because stock prices typically track sales and profit growth, and as such, they don't move higher in an entirely straight line either. ILMN Revenue (TTM) data by YCharts. Given that backdrop, it's certainly possible Illumina's struggles in Q1, which include top-line sales that were about 4% shy of industry watchers' projections, are simply another blip on the way to greater long-term growth. However, for that to be the case, Illumina is going to have to find a way to outmaneuver competitors eager to chip away at its market dominance. For example, Pacific Biosciences released its "Sequel" next-generation machine last fall, and that machine produces long-read data that may be particularly useful in researching next-generation medicine, such as cancer drugs. Roche Holdings (NASDAQOTH: RHHBY) has an arrangement with Pacific Biosciences that allows it to rebrand and sell the Sequel to its in-vitro diagnostic customers globally, and that could negatively impact demand for Illumina's MiSeqDx machine at some point. Similarly, the U.K. based Oxford Nanopore is also attempting to knock Illumina off its perch with an entirely new technology for sequencing. In 2014, Oxford Nanopore rolled out a handheld minION device that's the first and only nanopore sequencer on the market. This machine provides on-the-go genetic sequencing using next-generation technology that could ultimately be faster and cheaper than the technology used by Illumina. The minION doesn't compete with any specific Illumina machines itself, but Oxford Nanopore's plans include incorporating that nanopore technology into its PromethION, a much larger system that could threaten Illumina's top-of-the-line sequencers in future. Illumina recently filed suit against Oxford Nanopore, claiming it's infringing on Illumina's patents, so it's unclear how this battle may shake out. Finally, Thermo Fisher's ION S5 is a machine designed for targeted sequencing, which can be very useful in clinical settings. ION S5's features and pricing arguably match up favorably to Illumina's MiSeq, and therefore, Illumina could face some demand headwinds in the next-generation sequencing market from them as well. For its part, Illumina launched the miniSeq earlier this year. The miniSeq is a $50,000 machine that opens up the gene sequencing market to researchers of just about any size. Ultimately, the miniSeq could expand demand for higher-margin consumables, and that's important, but the big bread and butter money in this industry still comes from the mid-size to large market, and that's where Illumina faces the greatest risk. Pacific Biosciences is a small player with only 160 installed systems globally to its name, so it's unclear whether or not its Sequel is making significant headway against Illumina. Pacific Biosciences reports its first-quarter financials on April 21, so investors will want to read through their results to see if there are any clues regarding Pacific Biosciences' market share.Similarly, Oxford Nanopore and Thermo Fisher don't appear to be major threats now, either. Assuming competitors aren't to blame, then the big question facing investors is what's behind sluggish sales in Europe? In its conference call yesterday, Illumina attributed its lackluster first-quarter performance to a slowdown there, and for now, we're left guessing what's behind that drop-off. The company's still growing at a mid-teen pace in Asia and the Americas, so its not clear why Europe would be the exception. Perhaps the slowing is due to delays in projects, such as Genomics England, a massive attempt to sequence the genes of 100,000 people there. Or, maybe it's simply a hangover from Europe's ongoing economic uncertainty. Either way, Illumina's CEO Jay Flatley didn't sound impressed on the company's conference call yesterday. In that call, Flatley said, "We continue to believe that the market potential for next-generation sequencing in Europe is far greater than this outlook suggests and are clearly disappointed by this projection." That disappointment prompted Flatley to reorganize the European team, including relocating one of the company's top sales leaders to the region. Nevertheless, Europe's slowdown led management to cut their full-year growth revenue target to 12% from 16%, and absent proof that Flatley's restructuring is paying off with a European recovery, there's no guarantee he won't be forced to cut his outlook again at some point. Do the competitive threats and European uncertainty make Illumina too risky to buy right now? Not necessarily. Clearly, investors need more insight into why Europe's growth is slowing, but assuming it's not related to competitors, there's enough to like about Illumina to think a sell-off could be temporary. After all, Illumina remains the market share leader in a lucrative and fast-growing industry, and given Illumina's well established leadership position and its R&D depth, picking up its shares when they're trading on sale could be a savvy long-term decision.